Last time I talked about the next monitor standard: up from 1920x1080 pixels to 2560x1440 pixels. But some readers noted that even the least expensive monitors in this size range cost $300, and that's a bunch o'bucks. True. But for those writing on laptops, an external screen can make your writing easier for only a bag o'nickels (or close). I just saw an HP monitor on closeout for $39.99. Sorry, it was a one-day deal that's now gone (I should get to my marginal emails more quickly, I guess). It was only 1280x1024, but that's pretty good for text work. Add that to your laptop, and even if your laptop screen has that same resolution (it probably doesn't), you can get more text onscreen at one time. Over at NewEgg, an online vendor I've used with success, is a list of scratch and dent monitors starting under $27. Yes, $26.40 (as I write this). Great price for an external monitor that can give you the screen real estate you need to write more and better and faster. Bonus: if you have Window 10 on your laptop, using both screens at one time is pretty easy. Many people display their word processor on the big, external screen, leaving their email or notes on the laptop screen. Or maybe they put their notes beside their work in progress, because a big monitor has room for at least two full pages side by side. Instant boost in productivity (says workplace experts who may or may not be paid by the monitor industry). Not on sale, but at a regular price of $59.99 (and $11 shipping) over at TigerDirect is another HP monitor with resolution of 1366x768. That's the resolution of most average-priced laptops, but it's 19 inches rather than 14 or 15.6. I've had good luck buying from TigerDirect. The standard resolution for monitors now is 1920x1080. 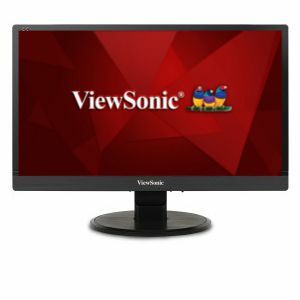 The ViewSonic monitor I put as the picture above is on sale as I write this for $79.99 and $7 shipping for a total of $87 plus a penny back. If TigerDirect has a physical storefront in your state they will add sales tax, but they'll warn you when you check out. Since many of us writers tend to be, um, experienced, bigger displays can be easier on the eyes. And for me, the more I see of the pages I'm writing, the better I write. Adding to, or doubling or more, your display space will make your writing laptop seem supercharged. And you can find out if this helps your output for less money today than ever before.